My 8 year old daughter Gianna wanted to start a tradition in our home, so she designated every night of the week a different culture's cuisine for our family dinner. So Monday night was Italian night. Two of our favorite Italian dishes are actually Chicken Piccata and Turkey Milanese. But this past Monday night, I wanted to introduce Gianna and Sasha to gnocchi. I thought it would be fun to incorporate it into a traditional American dish that they were already familiar with. Gnocchi is a light and airy fresh pasta made with flour and potatoes. 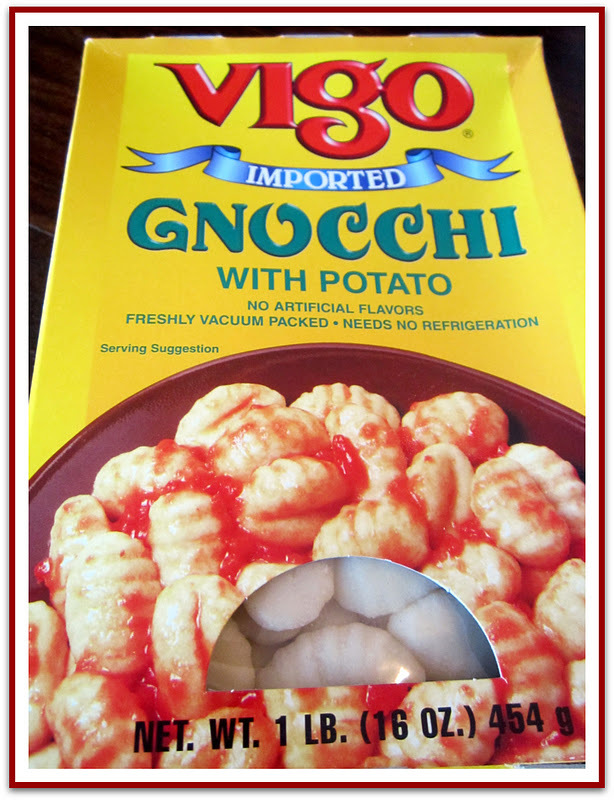 You can find several different brands in boxes in the Italian section of stores like Kroger Marketplace and The Fresh Market. I usually choose the ones imported from Italy. The name means "lumps" because that's what they look like. This Italian staple makes me wish I had a big stand mixer with a pasta atachment so that I could make my own homemade pasta. Fresh pasta is so delicious and tender. I made enough to fill my favorite Dutch Oven which I probably use on a daily basis. It's one of my favorite kitchen items. It holds just enough food for our family of four. I cooked the meal over a 2 day process so that I could easily skim the fat off the top on the second day. My husband's mother is in the hospital right now, and I've been talking to my daughters about good health coming from proper nutrition. When I was in pharmaceutical sales, I discussed the importance of Calcium, Vitamin D, and Omega 3s with doctors. Our trainers often told us that many doctors don't know much about nutrition. I love the doctors who tell their patients the importance of eating right and getting the vitamins that they need. I wish they all would do that - for a healthier population! My 6 year old Sasha cut these green beans and carrots for me. I love her interest in helping me cook! You can cut them as small as you'd like. I used about a fourth of a bag of fresh green beans and about a fourth of a bag of petite carrots. Add oil to the skillet. Heat over medium high until hot - about 5 minutes on my stove. Lay the chicken in the pan, and let it sear on each side about 4 minutes each. Remove the chicken from the pan. Add the onions and continue to cook over medium high for about 5 more minutes. Add some coarse kosher salt and fresh cracked black pepper. Return the chicken to the pan. 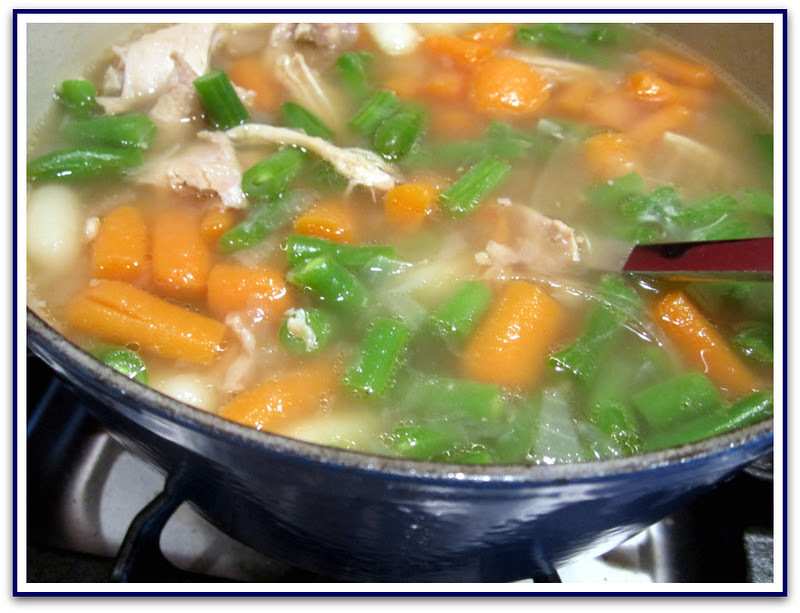 Add enough stock to cover the chicken - it may be more than 3 cups. You can store the rest of the broth later, if you're using the 32 oz. package. Turn the heat up to high, until you reach a full boil. Then reduce the heat to low, cover with a lid, and let it simmer about 20 minutes. Remove the pan from the heat until it cools. Remove the chicken, shred it with 2 forks, and add it back into the soup. Then refrigerate it until the next day. When ready to cook, remove the fatty layer from the top. Slowly heat over low heat while preparing the vegetables and gnocchi. 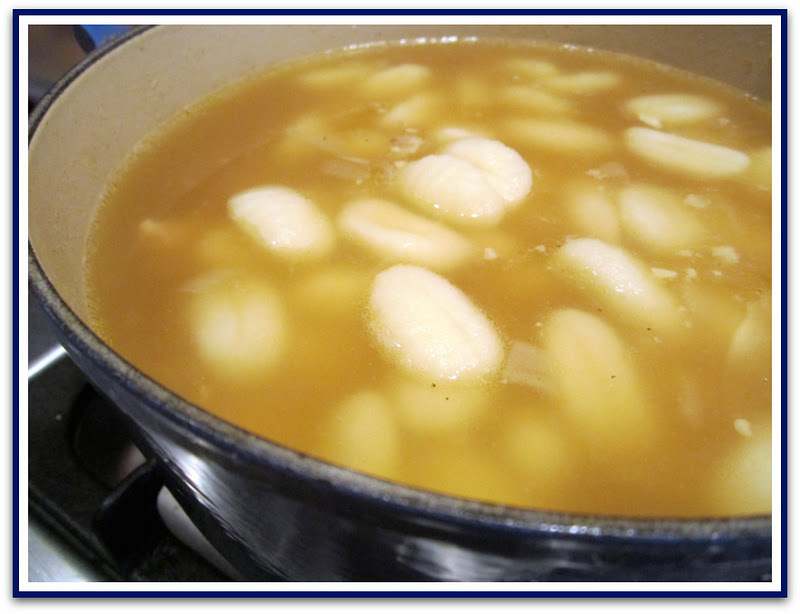 Fill a saucepan 3/4 full of water, bring up to a boil, and drop the gnocchi in. In only 3 - 4 minutes, they float to the top. They're ready. Add them to the chicken and broth. 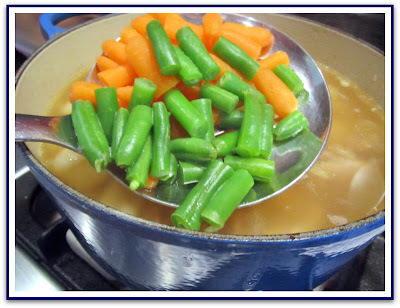 Reheat the saucepan - add water if needed. When boiling, add the carrots and green beans. 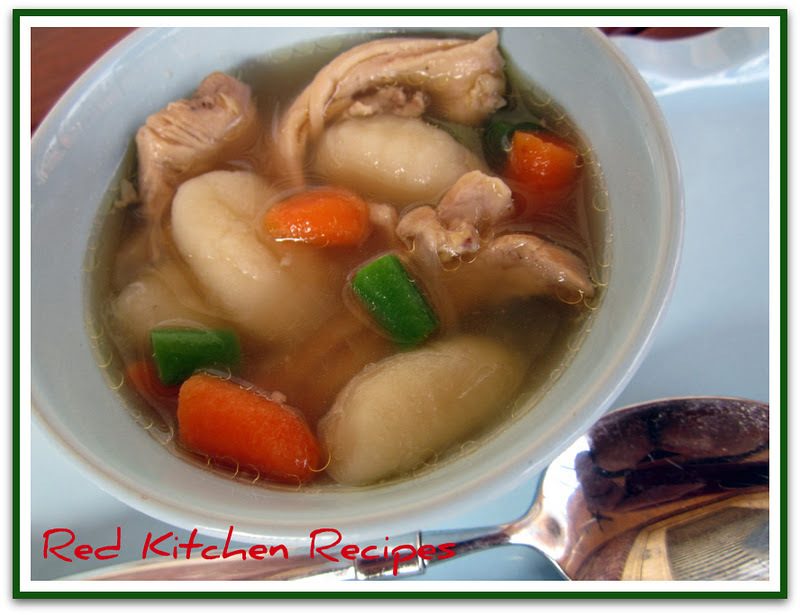 After about 3 - 4 minutes, when they are just tender enough, lift them out with a large slotted spoon and add to the chicken, broth, and gnocchi. 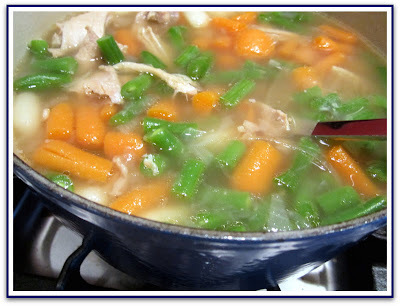 I love a good soup that combines fresh, healthy ingredients to fill you up. It's also great to see my family enjoy food that is good for them. That's what warms my heart.